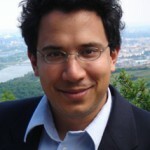 Dr Faisal is a Lecturer in Neurotechnology (US equivalent: Assistant Professor) jointly at the Dept. of Bioengineering and the Dept. of Computing at Imperial College London. He is also Associate Group Head at the MRC Clinical Sciences Center (Hammersmith Hosptial) and is affiliated faculty at the Gatsby Computational Neuroscience Unit (University College London). Today we visited Aldo Faisal (creator of the Faisal Lab for Brain & Behaviour) again at Imperial College to go through Neurotechnology prototype opportunities.